MENTOR - The Paradigm Building was the site for the 2019 State of the City Address for Mentor. It seemed fitting given the definition of paradigm is the standard, example, or archetype, and the bustling suburb of Mentor has often fit that mold. 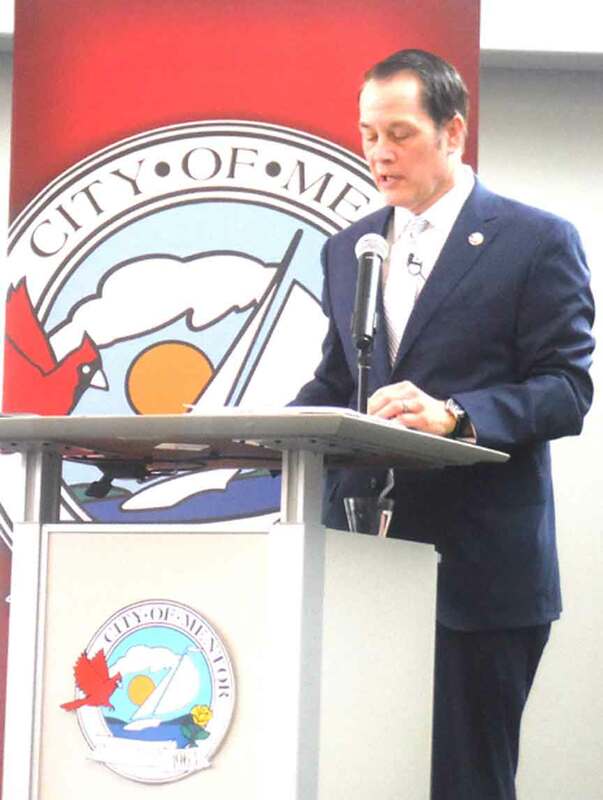 Mentor City Manager Ken Filipiak took the podium Feb. 26 for the 2019 State of Mentor address. He is a graduate from Georgetown University, and earned his master’s from Bowling Green State University. He has been the city manager since 2009 for Mentor. He then shared a story about former President and Mentor native James A. Garfield. He said Garfield began as a janitor and then made his way through the ranks of education, and ultimately served as the nation’s 20th President. Then Filipiak said he would outline the principles communities need to be guided by, chiefly Mentor. The first of these principles was healthy living. “People need access to quality treatment and rehab,” he said. Lake Health had added an 85,000-square-foot facility in Mentor during 2018. Great Lakes Gastroenterology also expanded during the year. The ribbon was cut on Danbury Assistant Living with a 70,000-square-foot facility. Looking forward, Filipiak said that a facial implant center will open on Hopkins Road, and two medical buildings will open on Norton Parkway, with Macy Family Dentistry and Great Lakes Jaw and Implant Center opening. Filipiak then touched on three healthier eateries which opened up in the city during 2018: Core Life Eatery, Urban Soul Grille, and Clean Eatz. Springbrook Gardens Park is open, but not entirely finished yet. It is a passive nature area that sits on 56 acres and offers two miles of soft walking, fishing, complete with a boardwalk. “A great place to contemplate your future,” Filipiak said. The next issue he touched on was security. “We need to feel secure. Our Mentor Police Department does a fantastic job of that,” Filipiak said. Bodycams got implemented in 2018 for the force, and last year saw criminal offenses go down 22 percent, and injury accidents fall 15 percent. “That’s 100 percent because of our proactive Police Department every day,” Filipiak said. He then mentioned that James Collier was the Crime Protector of the Year. “Our dispatchers deserve a lot of credit as well,” Filipiak said. The city dispatchers fielded 123,000 calls last year. The dispatch center just received an upgrade with a next generation 911 service. “It is a lot faster, and has greater accuracy,” Filipiak said. Titan and Bull, the two current Mentor Police dogs are retiring after going out on 300 visits and being responsible for 59 arrests last year. There will be a community party on May 25 called the K-9 Bark Out Retirement Party. The party will also be used to raise funds for charity. Kevin Knight, police chief of 37 years is also retiring. “You’ll surely be missed,” Filipiak said of Knight. “The Fire Department said 2018 was their busiest year. Oct. 20, 2018 was the busiest day they’d ever had. They had 500 calls on downed wires and fires, and made sure there were no injuries,” Filipiak said. The Fire Department has also been working with the Mentor school system, leading the way on safety drills. “Superintendent Matthew Porter is leading the pack in this,” he said. Bids will be out for a $3.2 million project this year for a new emergency response facility. The next principle the city manager touched on was environmental sustainability. In 2018-2019 there have been $400,000 worth of energy upgrades throughout the city. There are 200 trees planted annually. “Sustainability in the suburbs is important to raise the green IQ of citizens,” Filipiak said. The city reduced the flooding by 80 percent in the Bellflower area. This will add tens of acres of high quality wetlands, as it is returned to a natural stream. “We also need to protect the assets we already have. We are on a multi-year removal of invasive species at the nature preserve, which has over 500 saplings, native flowers and bushes,” he said. One thing Filipiak was very happy about was the Mentor Marsh restoration that occurred the past year. The marsh was contaminated by a salt dump. More than 360,000 tons of salt were removed. Another area Filipiak touched on was erosion management. “Lake Erie is our greatest asset for sure, but not always our friend. We improved 600 feet of shorelines last year that was an $800,000 project. This year we will do one million more,” he said. The next principle was traditional infrastructure investments. He said they were glad Plaza Boulevard was finally open, Filipiak said. Part of Hopkins Road underwent a major resurfacing in 2018. In 2019, the rest of Hopkins, between Hendricks Road and Market Street, will be resurfaced. A major undertaking road-wise in the Headlands is also underway, with Marigold Street being a $3 million project. The city has also started the complete reconstruction of Orchard Road, a project valued at $2.7 million. “The neighbors are very happy with it,” Filipiak said. Glenn Meadow, Glenn Lodge and Wake Robin are the next streets in the area to see reconstruction. This will be a $3.8 million project for the city. The city is also addressing fencing by route 306 and 2 and that will be a $380,000 project. “We hope it will look like the stretch by I-90,” Filipiak said. The detention basin is also a project that is underway, and that is half paid for by state funding. “The impact will be significant,” Filipiak said. “A lot of credit to David Malinowski and his staff,” he added. The next principle touched on was business development. Filipiak mentioned that 70 new businesses opened up in Mentor during 2018, and that the city rate of unemployment was 4.2 percent, a pretty consistent number. Filipiak highlighted a few new businesses including Heilind Electric, Accurate Metal Sawing and De Nora Tech. Steris added 34,000 more square feet, and MUM Industries made a $6.3 million expansion. ORBIS also relocated its warehouse to another location and is investing another $17 million over the next five years. “This year we just started the planning process of 50,000 square feet for Avery Dennison,” Filipiak said. Also open for business is The Inn at Doghouse, a doggy day care and spa. BurgerIM opened, continuing a tradition of franchises with the first Ohio location being in Mentor. Opening up in the Great Lakes Mall was Vietnamese Pho and Grill. Outback Steakhouse built a new location, as did Fastenal, and there is a new Wendy’s franchise open on the City Market Campus. Menards will open up in June, the 160,000-square-foot Meijer in May, and Giant Eagle is moving to city plaza in April. The mysterious covered building on Route 306 will be a new Starbucks location. Then Filipiak touched on some new and exciting businesses coming in 2019. Mission BBQ will open up in the former Bravo, and that building is also working on a second tenant. The Great Escape, which is a home leisure store, will come where the former Gordmans was. Slyman’s Tavern is coming to Mentor next to Title Boxing, and Brew Kettle will open up at the Great Lakes Mall near Round1. Filipiak also touched on a new industrial park coming with a life science spinoff of Mercantile. “I’m really excited for the year ahead internationally. We brought companies in and showed them what it’s like to do business in Mentor,” he said. “We will be going to the Med-Tech Innovations show in May in Birmingham, England where we will interact with hundreds of companies,” he added. The next guiding principle Filipiak mentioned was staying a caring community. “Washington is a bit of a mess, so we need to know togetherness is important. It requires caring citizens,” he said. “One of the darkest days in city history was on June 24, 2018 when Matthew Mazany lost his life. “The one positive was the incredible reaction by the community. They made makeshift memorials in front of the police, there was a candlelight vigil with over 1,000 people there.” The safety officers held a fill-a-cruiser event where donations filled three very large police cruisers in 2018, along with raising $22,000 that went towards Cops-For-Kids. The Fire Department raised $5,540 for the Rescue Needy Food Drive program, and it will be their 25th year doing so this coming December. There is a new rescue squad, and a backup fire engine called Comfort 54, a lavender truck to support the fight against all cancers. People have been writing messages on the truck. This story was forwarded over 600 times online. Mentor hosted the YMCA Dream House in 2018, the 25th year of this fundraiser. The Mentor Public Library is also having a different donation drive each month this year as they celebrate their 200th anniversary. Mentor is home to more than 30 churches, including St. John Vianney which is celebrating its 50th year as a parish. It is home to 12,000 parishioners. The city’s senior center has 5,000 members, and saw 63,000 visits and 17,000 meals served last year, as well as the surge of the Silver Sneakers program. The Mentor Ice Arena has had a huge year with youth hockey participation up 42 percent. The Ice Arena will host the 2019 U.S. National Championships where 38 of the best teams will come and play in Mentor at the end of March. Opening puck drop on Saturday, Oct. 27, saw Mentor’s first professional team debut with the Mentor Ice Breakers. The Ice Breakers’ regular season runs through early April, and tickets start at just $13. “Great family entertainment,” Filipiak said of the Ice Breakers. There will be several brand new water features at the area’s pools this summer, which had 70,000 visitors last year. The Mentor Amphitheater hosted 40 events last year, and will host even more this year. “We might even have a theater series possibly,” Filipiak said. The Cleveland Pops Orchestra will return on the Fourth of July, and the Mentor Rocks summer series will be back on Tuesday nights from June through August. The Gin Blossoms will also play a free show on July 27. The last principle Filipiak touched on was becoming a smart city with connected devices and sensors, and a 5G network, which is a high bandwidth network. He then touched on meeting changing housing demands, and is looking into luxury appointments and condo developments, possibly in the old Sears location. “Traffic, infrastructure, data collection analysis, criminal activity,” Filipiak said were ways they were implementing these new changes. That concluded the 2019 State of the City, Mentor address. Mentor City Manager Ken Filipiak gives his 2019 State of Mentor Address.